shipments to the Baltic States as well as to Sweden are increasing. 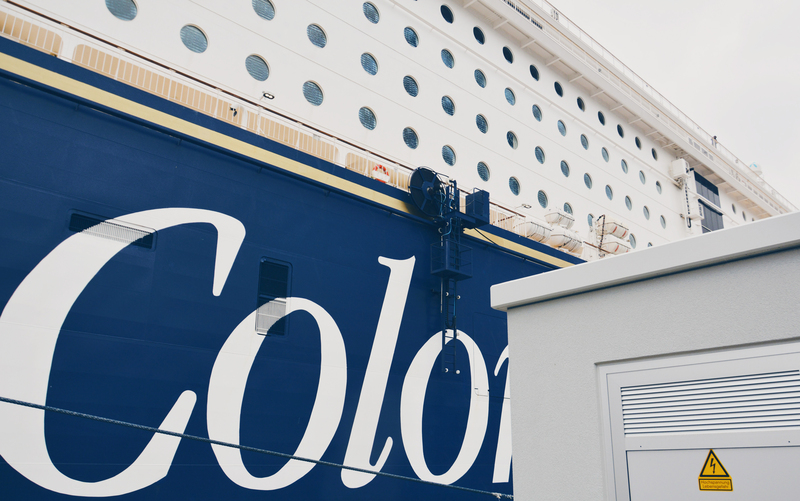 Additionally, the Norwegian-based Color Line introduced an additional cargo ferry on the route from and to Oslo which adds potential for an environmental friendly modal shift from road to sea. 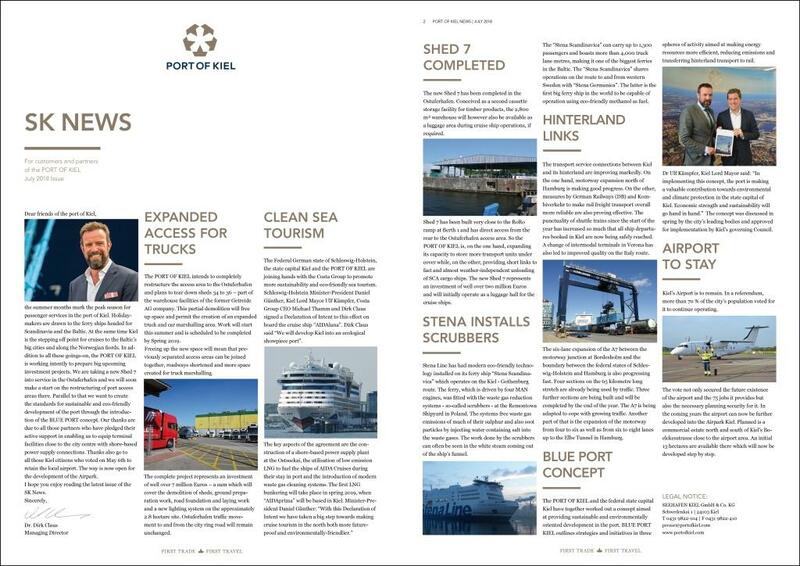 The PORT OF KIEL is also setting the course for a more sustainable future. In May, we will introduce the first onshore power plant at terminal Norwegenkai. Its use will reduce ship-emissions during laytime. We also have entered the tenderphase for a 16 MVA shore power plant which will provide cruise ships at Ostseekai and ferries at Schwedenkai with electrical power simultaneously. 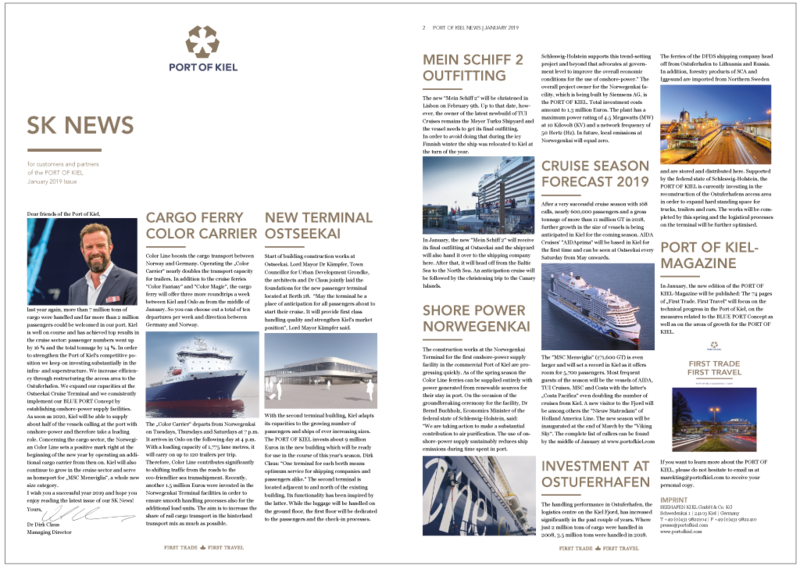 Our goal is to cover 60 percent of all energy requirements of vessels calling in Kiel with shore power. At the same time, we are investing in optimizing our port facilities in order to offer even better services to our freight customers at Ostuferhafen. And also cruise passengers will benefit from the redevelopment of the Ostuferhafen access area. I hope you enjoy reading our latest SK News. The installation of our first shore power plant at Norwegenkai is about to be completed. All supply lines are in place and have been connected to the air-insulated metal encapsulated medium-voltage switchgear already. As a next step, the PLUG-station will be installed making the onshore power plant ready for service. The official inauguration will take place in May. Soon, we will be supplying Color Line ferries at the Norwegenkai with emission-free onshore power during laytime. With the measure, the PORT OF KIEL is making a significant contribution towards air pollution control. The construction of this flagship project will cost about € 1.3 million and is co-funded by the Federal State of Schleswig-Holstein. In the following year the cruise ship terminal Ostseekai and the ferry terminal Schwedenkai will also get onshore power connections. A Europe-wide tender for this project was released recently. In order to guarantee a cost-effective operation, PORT OF KIEL is supporting the efforts to attain exemption from EEG-surcharge for shore power. Kiel is well prepared for the new cruise season. During the winter months we improved the scour protection at the ship berths at the Ostseekai terminal, repaired the northern fender line, and renewed the groove at the concrete beams. Additionally, construction work at the second terminal building, which is scheduled to be completed by the end of the summer, is progressing. The start of this year's season was marked with the calling of the "Viking Sky" on March 31st, even though the new "Mein Schiff 2" was a guest at PORT OF KIEL in January. Meyer Turku Shipyard used Kiel as the location to officially sign over the vessel to TUI Cruises. This year Kiel expects more than 600,000 cruise ship passengers for the first time ever, emphasizing the continuous growth of economic importance of sea-related tourism. Ferry- and cruise passengers generate sales of well over € 68 million in Kiel every year. About € 15 million of that are spent by cruise ship passengers and crew. And cruise passengers account for 100.000 hotel overnight stays. 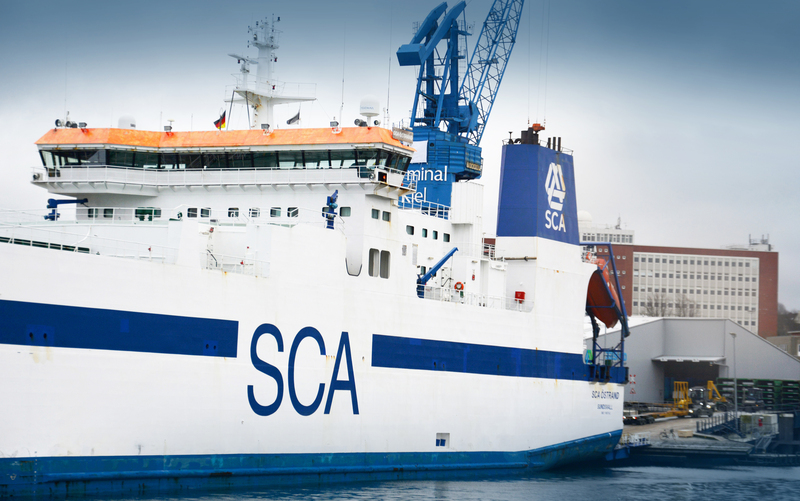 Two and a half years ago SCA Logistics GmbH relocated its operations to Kiel. 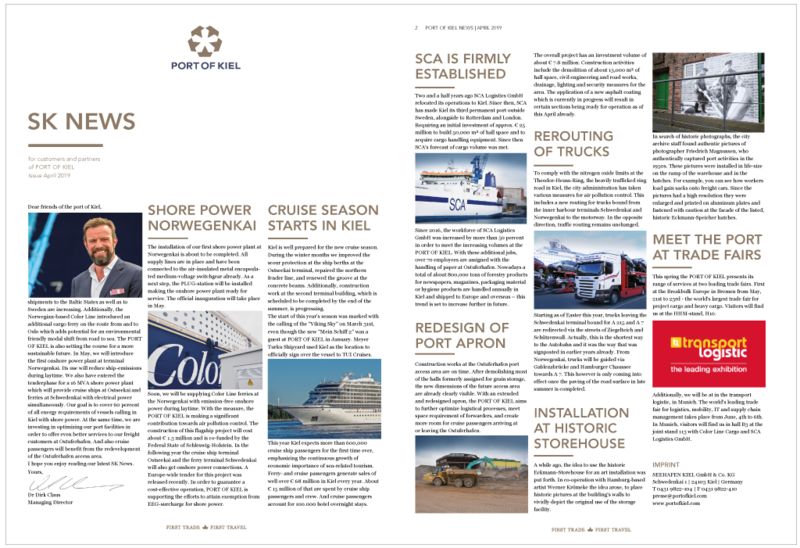 Since then, SCA has made Kiel its third permanent port outside Sweden, alongside to Rotterdam and London. Requiring an initial investment of approx. 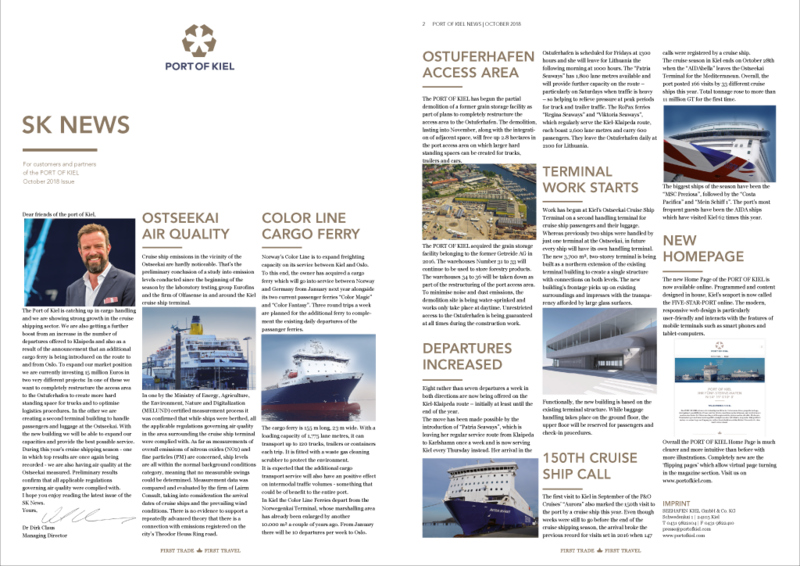 € 25 million to build 50,000 m² of hall space and to acquire cargo handling equipment. Since then SCA’s forecast of cargo volume was met. 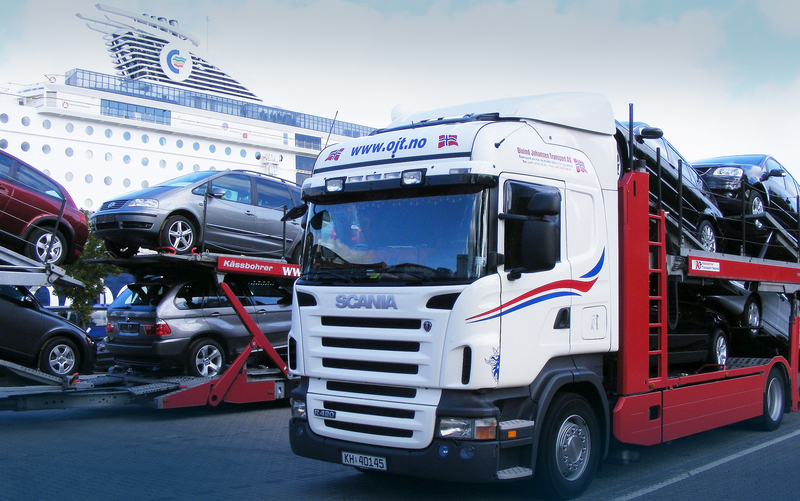 Since 2016, the workforce of SCA Logistics GmbH was increased by more than 50 percent in order to meet the increasing volumes at the PORT OF KIEL. With these additional jobs, over 70 employees are assigned with the handling of paper at Ostuferhafen. Nowadays a total of about 800,000 tons of forestry products for newspapers, magazines, packaging material or hygiene products are handled annually in Kiel and shipped to Europe and overseas – this trend is set to increase further in future. Construction works at the Ostuferhafen port access area are on time. After demolishing most of the halls formerly assigned for grain storage, the new dimensions of the future access area are already clearly visible. With an extended and redesigned apron, the PORT OF KIEL aims to further optimize logistical processes, meet space requirement of forwarders, and create more room for cruise passengers arriving at or leaving the Ostuferhafen. The overall project has an investment volume of about € 7.8 million. 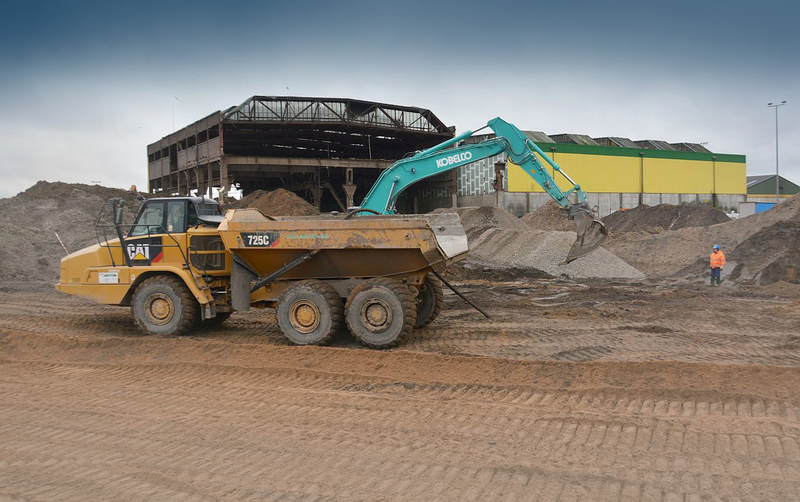 Construction activities include the demolition of about 13,000 m² of hall space, civil engineering and road works, drainage, lighting and security measures for the area. The application of a new asphalt coating which is currently in progress will result in certain sections being ready for operation as of this April already. To comply with the nitrogen oxide limits at the Theodor-Heuss-Ring, the heavily trafficked ring road in Kiel, the city administration has taken various measures for air pollution control. This includes a new routing for trucks bound from the inner harbour terminals Schwedenkai and Norwegenkai to the motorway. In the opposite direction, traffic routing remains unchanged. Starting as of Easter this year, trucks leaving the Schwedenkai terminal bound for A 215 and A 7 are redirected via the streets of Ziegelteich and Schützenwall. Actually, this is the shortest way to the Autobahn and it was the way that was signposted in earlier years already. From Norwegenkai, trucks will be guided via Gablenzbrücke and Hamburger Chaussee towards A 7. This however is only coming into effect once the paving of the road surface in late summer is completed. A while ago, the idea to use the historic Eckmann-Storehouse for an art installation was put forth. 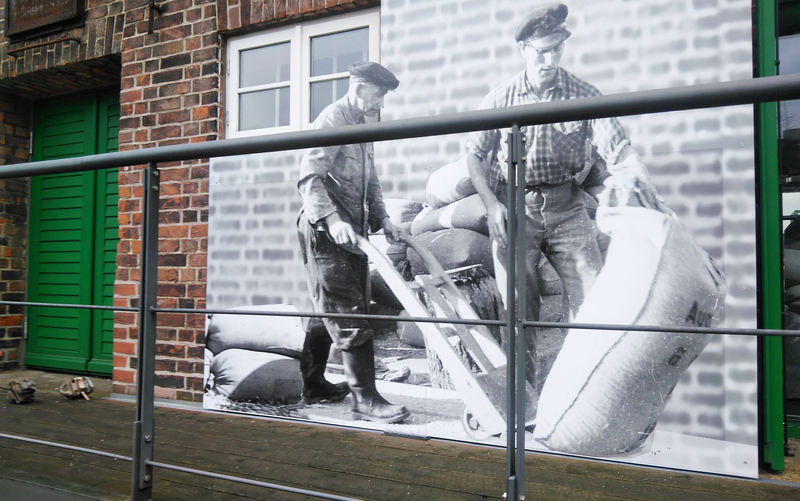 In co-operation with Hamburg-based artist Werner Krömeke the idea arose, to place historic pictures at the building’s walls to vividly depict the original use of the storage facility. In search of historic photographs, the city archive staff found authentic pictures of photographer Friedrich Magnussen, who authentically captured port activities in the 1950s. These pictures were installed in life-size on the ramp of the warehouse and in the hatches. For example, you can see how workers load gain sacks onto freight cars. Since the pictures had a high resolution they were enlarged and printed on aluminum plates and fastened with caution at the facade of the listed, historic Eckmann-Speicher hatches. This spring the PORT OF KIEL presents its range of services at two leading trade fairs. First at the Breakbulk Europe in Bremen from May, 21st to 23rd - the world's largest trade fair for project cargo and heavy cargo. Visitors will find us at the HHM-stand, H10. Additionally, we will be at in the transport logistic, in Munich. The world's leading trade fair for logistics, mobility, IT and supply chain management takes place from June, 4th to 6th. In Munich, visitors will find us in hall B3 at the joint stand 113 with Color Line Cargo and SCA Logistics GmbH.